I recently heard about the Kik Messenger app, an instant messaging application for mobile devices which, according to Wikipedia “took only 15 days for Kik Messenger to reach one million user registrations“. 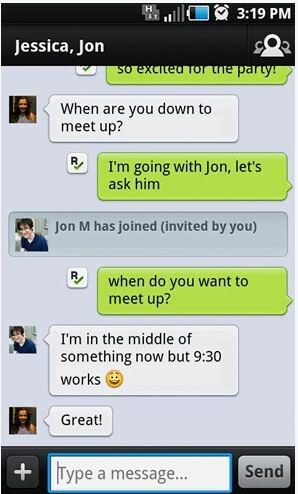 Kik Messenger has been described as a BBM killer – and as someone who has never owned a Blackberry phone I was interested in evaluating a cross-platform application who appears to be a competitor to the Blackberry’s key selling point: instant messaging. I have now installed the app on my Android phone and iPod Touch. I’m familiar with the benefits which messaging applications can provide over email through over five years of Twitter use and am interested in exploring the potential of an app which can be used with non-Twitter users. However in order to use such communication tools, you need to have people to communicate with. At present I only know the Kik username of one person. My username is ukwebfocus and I’d be interested in seeing how this app might be used to support my professional activities. Perhaps a tool such as Kik Messenger could have a role to play at an event, such as UKOLN’s 3-day IWMW 2012 event, in which it might not be appropriate to use Twitter for, say, administrative queries. Understanding the reasons why a service will be used. Understanding possible risks in using the service. Identification of ways of minimising such risks. A desire to evaluate instant messaging tools to complement use of Twitter. A need to evaluate tools which can be used to support communication needs at an event. A wish to be an early adopter in use of a social networking / communications tool in order to claim a meaningful identifier and to facilitate the development of a community. The tool may fail to reach a critical mass. The service may not be sustainable and the terms and conditions may change or the service itself, and the accompanying network and data may be lost. Use of the tool may result in a failure to make use of richer alternatives. The tool may not address a significant need. The benefits provided by the tool may not be sufficient to motivate others to use it. Raising awareness of the tool across my network. Acceptance of possible loss of content and community (as is the case with use of Twitter and text messaging on my mobile phone). Evaluation of use of the toll in different contexts. A willingness to use the tool in a small-scale context if it fails to gain significant market penetration. A willingness to accept the time lost in downloading and learning use of the tool if the service itself is not sustainable. It is interesting to note the differences between our two approaches. Doug, it seems, very much focusses on the service itself (it needs to be available as open source software) and a particular business model (a subscription service, rather than one which is funded through advertising, for example) although, like me, he provides an escape clause which acknowledges that there are risks in failing to use a service if doing so would mean he was unable to fulfil particular requirements. My approach, on the other hand, focusses on the outputs of the service and takes a disinterested view of the development approaches. Your email account has been an academically sanctioned identity for three or more years. And, unless you have a particularly benevolent institution that guarantees email for life, your account is about to end. Full stop. You may receive a letter asking you to ‘forward all important emails to an external account’ before your account is sedated (suspended) and put out of its misery (erased). If, like me, you have come to rely on your university email, you need an exit strategy, fast. “Now, two essential factors come into play. They’re so important; so you can quote me. Your email is not yours. It belongs to your university. If you (as is the case for me) you do not wish to become a system administrator, you should understand alternative sustainability options. Many people will be happy to make use of free services for which advertising and other uses of activity data help to fund the service whereas others, such as Doug, will be willing to pay a fee for such advertisements to be removed. It will be interesting to see the approaches to sustainability which users will select. There will be personal factors which come into play – and as someone who is happy to pay my TV licence feed and accept that when I watch ITV for ‘free’ that “I’m the product, not the user” I have chosen not to subscribe to Sky because of my antipathy towards Murdoch (although I have watch football on Sky in pubs). Revisiting my initial comments about the Kik Messenger service, I should probably add that there would also be costs and risks in using an open alternative (perhaps Jabber/XMPP). But what if a proprietary approach, though not platform-specific such as Blackberry’s BBM, is needed in order to establish that there is a real user need and establish appropriate technical requirements before the open alternatives are developed? Karl Marx suggested that there were a number of evolutionary stages in society’s development (the slave society, feudalism and capitalism) which had to be passed before a more equitable society was reached. The evidence of Twitter’s success and social networks such as Facebook hints at the difficulties of achieving the seemingly more equitable online environment which, as Doug describes in a post on Why we need open, distributed social networks supporters of identi.ca and Diaspora claim these services will provide. But can we build Openness in one country or might Blackberry BBM users benefit from moving to a more open cross-platform solution which has an API, albeit a solution which is not open source and for which, according to the FAQ, it does not seem possible to pay for an account? Hi Brian, great article. KIK is certainly exploding in use in a key demographic namely young teens, where cross platform and cross device ubiquity is its key benefit. Its not the first cross platform messaging service though, so it is an interesting case study of viral and word of mouth marketing generating users. Personally I just think that this demographic get a buzz out of “kikking” each other. Great branding. Thanks for the reasoned post, Brian, and for referencing my posts. I think there’s a real shift when people consider ‘free’ (as in no money changing hands). Because the only other time people give us things for free is in the form of a present (birthdays, Christmas, etc.) we’re tempted to see it as automatically a good thing, no strings attached. It’s taken me a long time (and some bitter experience) to realise that I’d much rather pay for something that I know is going to be around and doesn’t offer up my personal data as part of its IPO than a so-called ‘free’ alternative. I realise that people (especially in educational institutions where budgets can be an issue) don’t always have the luxury of paying for stuff. But that’s where a principled approach, as you’ve documented above, comes in! Thank you, I think education/institutions really need to wake up and ‘get real’ were just not making the most of or keeping up with current innovation. We should be using ‘open source software’ (easy/accessible open source, eg not perl ) and building sustainable and agile environments from the grassroots up. The danger is we and our education will get so far embed in commercial (ads and fees as standard and acceptable) alternatives that it then becomes difficult/impossible to withdraw, unfortunately there’s not too many alternatives being explored. As teachers and students we are socialised into what could be seen as restricted, uncreative, unfamiliar, out-dated and closed mode of being online, the VLE or institutional repository is built to conform to ‘old and closed’ conventional academic structures and processes. There is a huge leap to be made from the formal closed VLE into the ‘new’ open online ‘edusocial’ (educational social networked) open space, a leap into the unknown. There are currently no rules in this new open educational space and it’s something we are not being socialised into, we need to learn it ourselves and learn by doing. As creative practitioners we are attracted to the unknown and the challenges of the new, as with other significant and historical technological movements such as TV and cinema the language of the media/practice can be defined for us by others. The open educational movement presents a challenge to the sector as a whole; we have the opportunity to define our own new modes of educational practice. We at UAL have been exploring this for the past couple of years: http://process.arts.ac.uk/ emerged from grassroots activity, since 2006 its maintained a sustainable and independent system of development, through agile web development. The project fully relays on individual and group participation and is managed and developed through a combination of voluntary participation, research secondments and fellowships. The overall concept is to support ‘open practice’ cross college and sector communication and knowledge sharing. process.arts is not a repository or a VLE and courses are not represented in this space. process.arts provides an alternative environment for informal open content experimentation, mostly small pieces of content that do not have to represent a courses, be designed for learning, accreditation or represent an institution. process.arts provides a new ‘open learning’ space that straddles the institution (formal learning) and the social (informal learning) therefore allowing a space for open educational practitioners to develop a new open academic social practices/language without conforming or being influenced by pre-existing academic structures and processes.